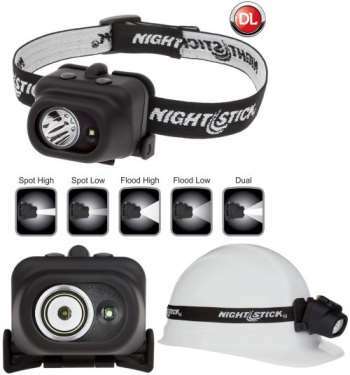 Nightstick -Multi Function Headlamp - LED - 3AAAThis non-rechargeable multi-function headlamp features a multi-position tilt head design and includes an elastic head strap with a non-slip lining. Utilizing Baycos exclusive Dual-Light design, this headlamp combines a tight-beam long-throw spotlight, with a wide-beam close area floodlight. Rated at 100 & 60 lumens respectively, the high and low-brightness spotlight beams on this headlamp are designed for distance illumination. This headlamp also has two wide-beam floodlight settings rated at 90 & 50 lumens. The floodlight spreads out in a wide even pattern of light expressly for the purpose of providing illumination of areas that are close by. The top mounted dual switches provide high/low-brightness spotlight and high/low-brightness floodlight.